It's the last day of the week, and you're feeling quite festive. Treat your feet to a shoe bouquet, like this pair of anklewrap platforms from Stella McCartney (available at Intermix). Floral-printed canvas on a 5 inch pale wood heel says you're a free spirit, but you've got a discriminating eye for style. Great with this summer's maxi dresses, they add a breezy flair to whatever you wear. In case you didn't know, Stella McCartney designs with the environment in mind. When you wear her shoes, it only makes sense to choose a drink that's equally Earth-friendly. Try the "Heavenly Hibiscus." 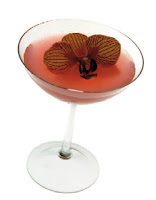 From the eco-focused folks at American Feast, this drink blends Chopin Vodka (made from naturally grown potatoes), hibiscus syrup, Grand Marnier Cordon Rouge, lime juice and hibiscus syrup (made from hibiscus tea). While the syrup adds the purple tint and a floral flavor, it may be hard to find, so if your bartender doesn't have it you can do without.